The year was 1951, and the month was May. The Ellsworth family, consisting of Whitney (my father), Jane (my mother), and me, was crossing the country by car, heading from our home in Greenwich, Connecticut, to California. For me, an eager 19-year-old, this trip was an adventure. That it would also turn out to be a moment in the history of American popular culture I could not have guessed. The centerpiece of our trip west was to be a full-day stop at the Grand Canyon, which none of us had ever seen. But once we arrived in California, our purpose was not a summer holiday, but work - at least for Whitney Ellsworth. My father, who was Editorial Director of National Comics at the time, had a summer assignment greatly to his liking. He was to act as consultant to the brand new Superman television unit which had just been set up at RKO Pathé Studios in Culver City under the supervision of Robert Maxwell and Bernard J. Luber, producers. 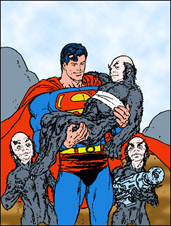 My father's main job was to work on script development for the first season of the Adventures of Superman. He was supremely knowledgeable about the character of Superman, having been the artistic head of DC Comics (later renamed Superman Comics, and still later, National Comics) since 1940 and thus having been in charge of story development for the company for eleven years. Also, during World War II, my father had authored the Superman Sunday page, syndicated in newspapers across the country, pinch-hitting for Jerry Siegel, Superman's creator, who was away in the army. It was quite natural that Bob Maxwell (as Robert Maxwell was always known in my family), the real creative head of the television production team, would have asked my father to come on board, since the two of them had had years of collaboration on the Superman radio show which Maxwell had produced for DC on a freelance basis in New York City. My father's hand in that project was also "story," always his forte, and from which he'd received journeyman training as a highly successful writer of detective pulp fiction in the 1930s. My father's task as "developer" of scripts for the Superman production unit meant he would help choose the writers and then aid them in working out plots suited to the Superman character. My father would also take a hand in the writing, co-writing, rewriting, and editing of scripts as the occasion demanded. On that May day (the exact date was May 25, 1951), when we piled into the car and headed for California, we had only gone about as far as the unlovely New Jersey meadows when my father let my mother and me in on a surprise. It seems that he had agreed to "noodle" (his word for "think up") and then write a feature film with which the Superman production team planned to kick off the new television series. The film would be sort of a "two-fer," for it would be released whole in movie theaters, gaining publicity and financing for the new television series, and then later would be included in the series as a two-part episode. What came as a surprise to my mother and me was not that my father had taken on a crucial and challenging writing assignment, but that, as he explained, he planned to think up and plot out the movie in his head while driving from Connecticut to Arizona. Then when we reached the Grand Canyon, he planned to hole up in our motel room and knock out the first draft of the movie on his portable typewriter. "Won't you be able to do any sightseeing with us?" my mother asked a little plaintively. "Are you going to spend all your time at the Grand Canyon writing?" "What's the movie going to be about?" I asked. "I don't know," said my father, "But I'll know by the time we get there!" It was toward evening on our fourth day out from Connecticut, after crossing the rising plains of Kansas and witnessing a flaming Kansas sunset, that we reached the panhandle of Oklahoma and entered a truly eerie landscape. By now the sun had set, leaving the sky a haunting shade of mauve, when suddenly we saw a towering forest of oil derricks etched against the afterglow. "Ooh," we said to each other, "isn't this strange? It feels just like being in another world!" By now we were pressing on, right through the thick forest of derricks that seemed to be closing in on every side. We felt oddly trapped, like fish out of water caught in a net of machinery! Still, we kept driving on, for it was only by this road through the oilfields that we could reach our next stop - Dalhart, Texas. At length, emerging from the oilfields, we breathed a sigh of relief. It had not been a pleasant experience (it had even smelled bad in there! ), but it had been a fascinating one. After Dalhart, we crossed New Mexico, overnight at Gallup. Then the following morning, as we approached the Petrified Forest, my father said, "I think I have the idea for the movie! Tell me what you think of it!" "The action takes place in a small town near the edge of a large oilfield. The oil-well drillers, for some reason, plan to sink a new well much, much deeper than any well has ever been sunk before. This exploit has attracted the attention of the national press, including, of course, the Daily Planet. So Clark Kent is sent to cover the story." "Yes, yes! Go on!" my mother and I encouraged. "Well, when the well is sunk, nothing unusual happens for a few hours. Then, by night, three or four little creatures from the center of the earth are seen to clamber out from under the well cover, blink their eyes, and tentatively start out to explore the town. These little creatures look like brownies, or maybe elves, and, of course, they are completely innocent, meaning no harm whatever to mankind. The only thing is" - and here my father paused so his next words would convey a deep impression - "they're radioactive!" "How do you like it so far?" my father asked. "Oh, it's good!" my mother responded. "Yes," I said, "I like it! What happens next?" "Well," my father went on, "eventually the little creatures encounter a little girl who wants to play ball with them. She even tosses them her ball, and they toss it back. But by touching her ball, they've made it radioactive, which we know because of how it glows! Some of the townspeople see the shiny ball and soon find out that there are creatures around from another realm. Well, as you can imagine, at this point all heck breaks loose." My mother asked, "Do those townspeople try to harm the creatures?" "You bet they do! They try to kill them!" "But Superman comes to their rescue!" I chimed in. "Because luckily Clark Kent is covering the story for the Daily Planet," my mother added. "Goodness, you two ought to write these things!" my father chuckled. But my mother and I knew that Whitney Ellsworth was the one to do it, and we were just the cheering section. That afternoon we passed through Flagstaff and drove up onto the plateau that skirts the Grand Canyon's south rim. I recall that we could not get rooms at El Tovar, the ritzy hotel, but luckily found one room available at The Lodge, the more modest accommodation, where the three of us bunked in together. And it was in that room, whose number is lost to history, that Whitney Ellsworth banged out the first draft of Superman and the Mole-Men. This film, which has become a cult classic, its final form worked over by Maxwell and Ellsworth in concert, bears the script credit "Richard Fielding," the nom de plume always henceforth used by the Maxwell-Ellsworth collaboration team. As a postscript, I'll add that Mother and I did have a good time taking the bus ride along the south rim of the canyon, with its gorgeous, spectacular scenery and its thrilling drop-off of 5,000 feet! We did not feel bad that my father had not accompanied us because we knew how much satisfaction he was getting out of working on his script back in our hotel room. But once we were all in bed that night in our room, which was perched on the canyon's rim, we could not resist sharing with my father the words of the park ranger about how chunks of the canyon's rim would break off from time to time and plummet to the canyon floor. "CR-U-U-NCH!" I called out very loudly in a playful effort to scare my father. "Stop that!" he shouted. "That's not funny!" "But Darling," my mother rejoined, "You wouldn't want us not to tell you. You may be able to use it in one of your scripts someday." Special thanks to Jim Nolt.